There a few simple guidelines that you should follow when teaching their new dog proper manners around their cat. In the beginning, NEVER leave the dog and cat alone in the same room unsupervised. Do not buy the dog any squeaky or plush toys. These can sound and feel like the cat and can encourage the prey drive in the dog. Make sure to keep the cat's toys picked up or in an area where the dog cannot get them. Cat's toys are typically smaller than a dog's and can be a choking hazard. They also can be a source of possessive aggression between the dog and the cat. Next, follow our Leadership Exercises with the new dog. This will help establish you as the pack leader and dictate to the dog that the cat is part of the pack and not prey or a play toy. Always reward the dog for showing the correct behavior around the cat. For example, if the cat comes in and the dog ignores the cat, he or she should be rewarded for this behavior by petting, giving a treat, etc. 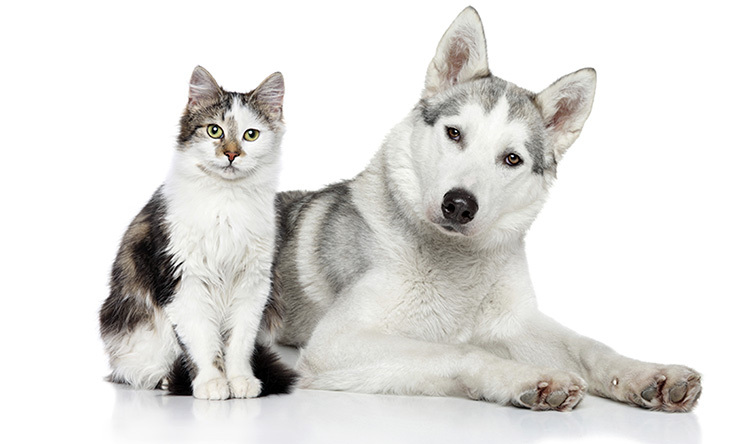 Make sure the dog and cat are separated except during training. During training, put the dog on a leash and establish a threshold. The threshold is the distance between the dog and the cat just before the dog shows aggression towards the cat but decides not to. Reward the dog for offering the correct behavior when they pay attention to you and not the cat. Work some simple obedience commands as well to help keep the dog's attention on you. Gradually decrease the distance a little at a time and increase the reward for the dog. If the dog shows aggression towards the cat at any point, move further away from the cat until the dog's attention is back on you and reward them. Consistency is the key but with time and patience, the dog can create a positive association with the cat and learn the correct behavior.